It's been a long time since I have done one of these, or at least posted about one. I have slipped a few non-posted Topps Cards That Never Were into my "gallery," such as a 1964 Stan Musial and 1980 Catfish Hunter. The Musial card came out nice, so it should deserve its own post, but not this one. This post goes to "Cakes" aka Jim Palmer. By the time I was realizing the greatness of baseball in 1984 (Pads vs Tigers), which was far after I started collecting cards (circa 1979), I was unaware of Jim Palmer. I missed all the hype about him in his underwear (Thank God) and knew little of him because his star was fading by 1984. 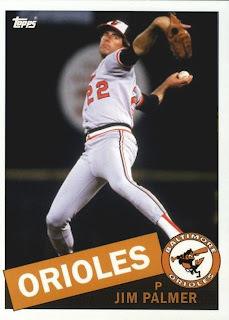 In fact, in 1984, the Orioles had felt his star had collapsed into a white dwarf, and released Palmer after he went 0-3 with an over 9 ERA at the beginning of the 1984 season. The Orioles did give Mr. Palmer the option of going on the voluntary retirement list, to which Cakes declined, so the O's released him. Unlike Baltimore's move, Jim was classy and decided to retire. While I didn't know much about Cakes while he played because he was excluded from the 1975 release of Superstar Baseball tabletop game (which I still play) in favor of Mike Cuellar, I did learn about him in 1991. During this spring training, seven years after his retirement and AFTER he had already been inducted into the Hall of Fame, Palmer decided to make a comeback. This time the Orioles were open arms because of the publicity and dollar signs (Stay classy, Baltimore), but Palmer's comeback was ended after a poor spring training showing with an 80 MPH fastball. However, I give him credit for trying, and given the fact he is/was in fantastic physical shape. Must of been the tighty-whities. Anyways, a story from the 1991 spring training goes like this: "While working out at the University of Miami during his comeback attempt, Palmer was approached by Hurricanes assistant coach Lazaro Collazo. Collazo, presumably not recognizing Palmer, reportedly told him, "You'll never get into the Hall of Fame with those mechanics." "I'm already in the Hall of Fame," Palmer replied." Ahhh--Superstar Baseball. It was the first tabletop baseball game I played. I played it for most of the 1970s before getting APBA in 1979. Now I'm a Strat-O-Matic player, but I still have my Superstar Baseball cards. It's easy to tell which players got used the most (Cobb, Wagner, Ruth) and which players almost never got used (Wheat, Averill, Hippo Vaughan). Great memories.